The stainless Steel battery canister has rotary switch and charging port. It is designed to mount on diver’s waist belt on the left or right side with screw-in wet plug cable comfortably reaching the socket on the bulkhead connector block. The rotary switch on the battery canister allows diver to set three levels of heat output as well as to completely switch the heat off. 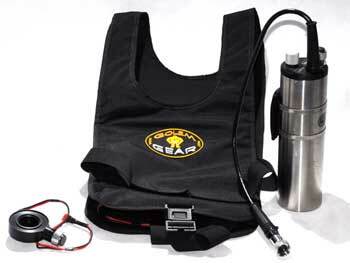 The Q-Vest is powered by 12V 11Ah NiMH battery providing several hours of comfortable heat output. The battery and electrical connectors are the weak point on this unit. The two pronged connector that comes from the battery to the suit connector has two tiny o-rings that you really have to be careful with and make them tight. We have gone through 3 battery units over two years. They just seem to stop working a lot. When the system is working, it is nice, especially with the different heat settings.